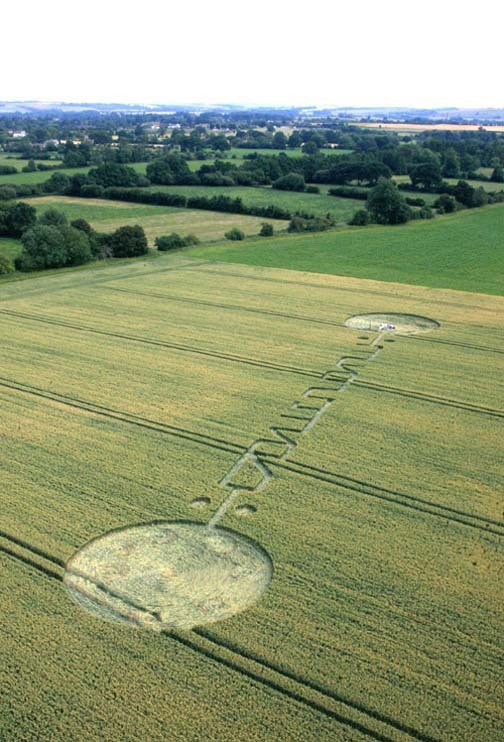 Nearly 300-foot-long crop pattern in Honey Street field near Alton Barnes, Wiltshire, England, reported July 4, 2011, has symbols some interpret as Pi. Image © 2011 by Lucy Pringle. July 6, 2011 Honey Street, Alton Barnes, Wiltshire, England - On July 5, 2011, I received the email below from an Earthfiles viewer who had been studying the July 4, 2011, crop formation reported in a wheat crop along Honey Street near Alton Barnes, Wiltshire, England, and posted at Cropcircleconnector.com in their early July crop formation reports. Previous PostPrevious Cold Fusion – For Real?